I was flipping through shows on Hulu (every year they compile a list of Christmas episodes and specials available), and I saw an episode of Suburgatory titled "Krampus." Calling something "Krampus" is a good way to pique my interest, so I hit play. 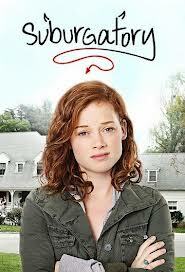 Keep in mind I don't remember ever hearing of "Suburgatory" before, so I was going in blind. It was certainly an odd thing to jump into. It seems to revolve around a teenage girl, Tessa, who's recently moved to "the suburbs" with her single father. The focus jumped around a lot, so a good portion of the episode was devoted to minor characters. Also, the show wasn't entirely episodic, so a lot the plot lines were continued from previous episodes (though, in Christmas tradition, it seemed to wrap most of them up). Tess went to spend Christmas with her (newly discovered) mother. Her neighbor discovered he was adopted, went crazy, and ran off on his own. A spoiled rich girl tried to win back her housekeeper. Honestly, I'm probably forgetting a few. By the numbers, this should have been bad. It was jumping between a large number of subplots for a half hour, it relied on farcical comedy, and almost all the characters were absurd characterizations. But... you know something? This was actually pretty good. The approach to comedy employed here is usually my least favorite, but they sold it with good writing and with actors and directors willing to commit to the concept, no matter how ridiculous. The show was mostly farce, with a few moments of drama imposed here and there, but it was clearly produced by someone who understands farce. I found it funny: even really funny at times. The only thing keeping me from giving this the "highly recommended" label is the ending. The last couple of minutes, which resolved the neighbor's plot, felt forced and - in my opinion - betrayed the episode. Now, keep in mind I haven't seen the season and a half before it, so it's possible I just don't know the characters well enough to appreciate it. But, given what I did see, it killed the momentum. Still, if you find yourself with a few minutes to kill, this might be worth checking out.